At a research ethics workshop at the 2015 CSCW conference (Fiesler et al., 2015), researchers in our community respectfully disagreed about using public social media data for research without the consent of those who had posted the material. Some argued that researchers had no obligation to gain consent from each person whose data appeared in a public social media dataset. Others contended that, instead, people should have to explicitly opt in to having their data collected for research purposes. The issue of consent for social media data remains an ongoing debate among researchers. In this blog post, we tackle a much smaller piece of this puzzle, focusing on the research ethics but not the legal aspects of this issue: how should researchers approach consent when including screenshots of user-generated social media posts in research papers? Because analysis of visual social media content is a growing research area, it is important to identify research ethics guidelines. This opt-out approach is only ethical in certain cases. For instance, it is not in line with the Australian National Statement on Ethical Conduct in Human Research (National Health and Medical Research Council, 2012), which we assume was not written with social media researchers as its primary audience. NHMRC’s Chapter 2.3 states that an opt-out approach is only ethical “if participants receive and read the information provided.” In a social media context, people may not necessarily receive and read information messaged to them. Additionally, researchers and ethics committees may not agree on whether or not these people are “participants” or whether such a study constitutes human subjects research. When using non-identifiable images, as we did in our study described above, and when the study’s benefit outweighs potential harm done to those who posted the social media content, we argue that an opt-out approach is appropriate. However, an opt-out approach becomes unethical when sensitive, personally-identifiable images are included in a research paper, as we discuss next. While issues of consent when using social media content in research papers remains a thorny ongoing discussion, in certain instances we believe researchers’ decisions are more clear-cut. If social media content is identifiable – that is, if the poster’s face and/or name appears in the post – researchers should either get explicit consent from that person, de-identify the image (such as by blurring the photo and removing the name), or use ethical fabrication (Markham, 2012). Particularly, we strongly argue that when dealing with sensitive contexts, such as stigmatized identities or health issues, a person’s face and name should not be used without permission. As an example, let’s say that a woman posts a picture of herself using the hashtag #IHadAnAbortion in a public Twitter post. A researcher may argue that this photo is publicly available and thus is also available to copy and paste into a research paper. However, this ignores the post’s contextual integrity (Nissenbaum, 2009): when taking the post out of its intended context (a particular hashtag on Twitter), the researcher fundamentally changes the presentation and the meaning of the post. Additionally, on Twitter, the poster has the agency to delete the post at her discretion, a freedom that she loses when it becomes forever embedded into a research paper and all of the digital and physically distributed copies of that paper. Thus, we argue that when including identifiable social media data in papers, researchers should be obligated to receive explicit permission from the person who posted that content, should they wish to include that image in the paper. Though all tweets are archived by the Library of Congress and thus not fully deletable, they are not readily accessible by the public, and even by most researchers. Furthermore, Twitter’s Terms of Service require those who collect data to periodically check for and remove deleted tweets from their datasets, though it is not clear whether this applies to the Library of Congress (Twitter, n.d.). Nissenbaum, H. (2009). Privacy in Context: Technology, Policy, and the Integrity of Social Life. Stanford University Press. “Have you got ethics yet?” is a question asked frequently where health, social and behavioural sciences postgrads gather on campus. The amount of time human research ethics committees take to approve an application is also a common topic of conversation among university staff. Researchers often, it seems, grumble about delays in beginning their data collection while their ethics application awaits approval. As a recently retired chair of an ethics committee I confess that I rarely felt sympathy for these grumblers. Mostly, it seemed to me, they simply failed to plan their research time-line to match the clearly stated realities of the ethics application and approval process. However, I believe that ethics committees need to have in place processes which can take accommodate an important issue in need of research which has arisen unexpectedly and where data collection is time critical—such as following a disaster event where agencies need researchers to be in the field collecting data from those affected before the quality of the information is compromised with the passage of time. Starting with the 2009 Victorian Black Saturday bushfires (173 deaths, 2029 homes destroyed) I have been involved in several post-bushfire field research interview surveys of affected householders about their pre-fire bushfire risk perceptions, plans and preparations, and their decisions and actions during the fire. The studies were conducted at the request of fire and emergency management agencies. No adverse incidents occurred. The findings have assisted agencies in reviewing and refining their community bushfire safety policies and procedures. A good case can be made that the timely information gained by the post-bushfire interview research has contributed to improved householder bushfire safety. 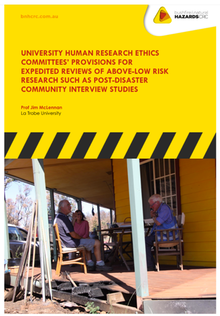 In the post-bushfire research where I was the chief investigator 2011 – 2014, approval of these above-low risk studies by my university’s Human Ethics Committee was speedy—within 72 hours. Each application was in the form of a modification of an originally-approved application from 2009. However, colleagues across a range of institutions have told me that it would be very difficult for them to undertake similar post-disaster research because of the time that would be required to obtain approval of such above-low risk research from their human research ethics committee. Concerned about this apparent situation, I decided to investigate how many Australian university human research ethics committees (UHRECs) had provisions for expedited review of above-low risk research. I believe that UHRECs which have no provisions for expedited review of above-low risk research do their institution, and the wider society, a disservice. Jim McLennan is an adjunct professor in the School of Psychology and Public Health at La Trobe University, Melbourne. You can access Jim’s La Trobe University profile here and he can be contacted at J.McLennan@latrobe.edu.au.